The Nintendo Entertainment System isn’t as rare as one might think given its age but that doesn’t mean everyone has one lying around. And if you do, it’s probably stored away in a closet or attic somewhere as keeping it hooked up with a collection of games can take up valuable space. Nintendo feels your pain which is why they’ve announced a brand new version of the classic console that fits in the palm of your hand. The NES Classic is a near-identical, mini replica of the original that plugs directly into your HDTV via an included HDMI cable. 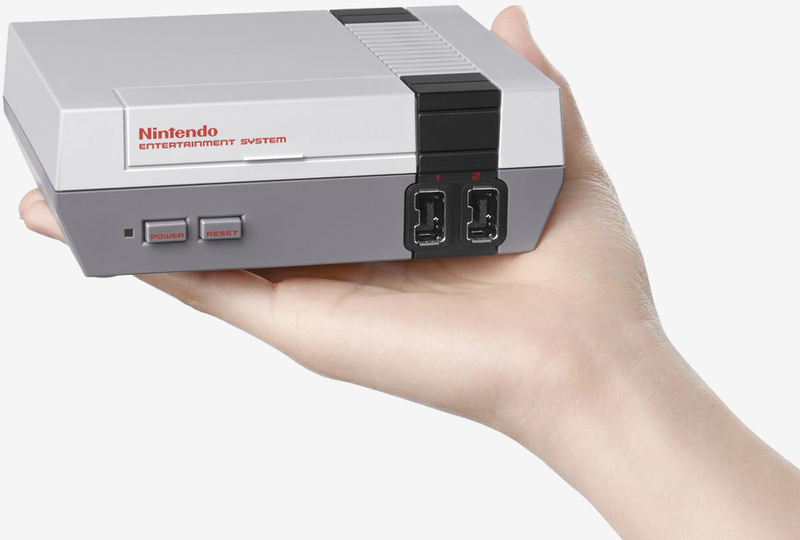 It comes with 30 of the top NES games pre-loaded as well as the AC power adapter and an NES Classic controller which of course, is designed after the original. The full list of games is as follows: Balloon Fight, Bubble Bobble, Castlevania, Castlevania II: Simon's Quest, Donkey Kong, Donkey Kong Jr., Double Dragon II: The Revenge, Dr. Mario, Excitebike, Final Fantasy, Galaga, Ghosts' N Ghoblins, Gradius, Ice Climber, Kid Icarus, Kirby's Adventure, Mario Bros., Mega Man 2, Metroid, Ninja Gaiden, Pac-Man, Punch-Out!! Featuring Mr. Dream, StarTropics, SUPER C, Super Mario Bros., Super Mario Bros. 2, Super Mario Bros. 3, Tecmo Bowl, The Legend of Zelda and Zelda II: The Adventure of Link. It’s hard to argue with that list as it has a little something for everyone. The NES Classic goes on sale November 11 priced at $59.99.